What it is: A naturally dark tanning lotion for a sun-bronzed look without the sun. What it's used for: Achieve a deep, natural-looking tan for the face and body while avoiding the harmful rays of the sun with Sun Laboratories Ultra Dark Lotion. This highly moisturizing formula coats the skin in an instant dose of color to prevent streaking or patchiness. The natural active ingredient, a sugar derivative, then works deep in the skin to intensify the color over a three hour period, resulting in a rich, natural-looking hue. Its non-clogging formula is ideal for all skin types, even sensitive. Directions : Smooth evenly over face and body. Color is instant and will intensify in 3 hours. To avoid discoloring palms wash hands with soap and water immediately after use. For best results exfoliate skin regularly with the Exfoliant Body Gel. To maintain tan apply Ultra Dark 1 to 3 times weekly in conjunction with the Tan Moisturizer Maintainer. Alternate using Ultra Dark in the evening and the Tan Moisturizer Maintainer in the morning. Ingredients : Deionized Water, Dehydroxyacetone, Caprylic/Capric Triglyceride, Glycerin, Glyceryl Stearate (and) PEG 100 Stearate, Hazelnut/Pecan Oil, Cetearyl Alcohol (and) Ceteareth 20, Cetyl Alcohol, Sorbitan Stearate, Aloe Vera Extract, Dimethicone, Phenoxyethanol, Hydroxyethylcellulose, Tetrasodium EDTA, Methylparaben, Tocopheryl Acetate, Propylparaben, Fragrance, Sodium Metabisulfite, Ascorbic Acid, BHT, Citric Acid, FD&C Yellow #6, FD&C Red #40, FD&C Blue #1. Self Tanning Lotion - Very Dark - 8 oz. For those who demand the deepest and darkest tan available this is for you. 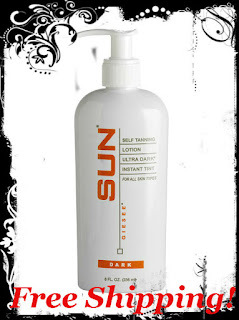 It's the Darkest shade (Dark Sunsation) in Sun Laboratories self tanning line. This rich, smooth, Very Dark (Dark Sunsation) self tanning lotion will give you a beautiful golden brown sunless tan instantly that lasts up to seven to ten days. Sun Laboratories makes the best and darkest sunless tanning lotion, spray and foam in the self tanning industry and is rated the # 1 most popular and best sunless tanning product.